Lately, the term plant based diets has been thrown around quite a bit across various media channels. For the most part, a plant based diet is basically a vegan or vegetarian diet, it is just a new term that is being used as a marketing tool to catch people's attention. A lot of information that is being told about plant based diets is based off of very poor science, or shown in a very particular way to make the data look better than it really is. One of the main culprits of this information is the documentary What The Health, which has been thoroughly debunked by Robb Wolf (his post can be found here) and many others. Due to so much of this information being so far on the wrong side, and my concern of the health of people who decide to follow these claims, I decided I needed to talk with someone who has been down the vegan road before and has felt the impact that these diets can play on the body. Granted, some people do very well on a plant based diet and I don't want to take anything away from them, but for the majority of the population, there are health concerns and nutrient needs that need to be discussed beforehand. There is a reason that there has never been a civilization that has relied 100% on plant material to survive. 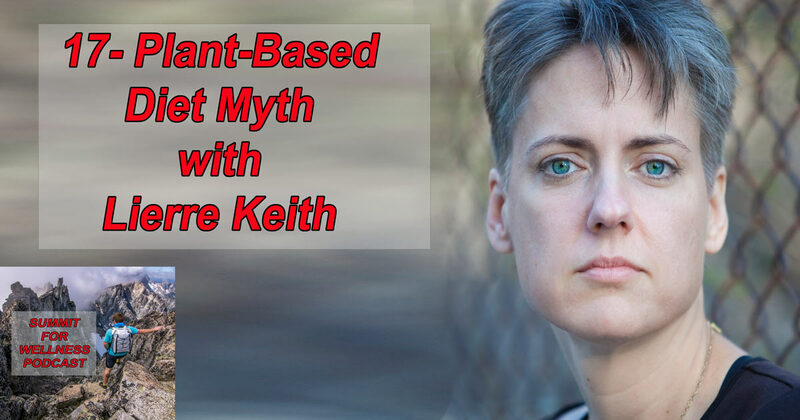 All this can be learned in this episode of Plant Based Diet Myth with Lierre Keith! 12:00 – At the beginning of transitioning to veganism, typically people feel better. Why is that? 21:40 – Popular vegan Youtuber said that menstrual cycles are unclean, is this a common thought process amongst vegans? 24:40 – Are there fat-based vegans who use more avocado and coconut fats? 27:30 – Can you live more as a vegetarian and only consume some animal byproducts such as eggs, dairy, etc? 33:55 – Is agriculture as morally right as it seems? Do animals die in the process to support agriculture? 37:30 – Is there a way to create a sustainable agriculture or livestock farming to be able to support 7+ billion people? 57:30 – If you had 2 minutes in front of a group of young teenage women who are thinking about veganism, what would you tell them? Thank you for listening to this episode of the Summit For Wellness Podcast. If you enjoyed Plant Based Diet Myth with Lierre Keith, then subscribe to our channel so you can listen to all the latest episodes.